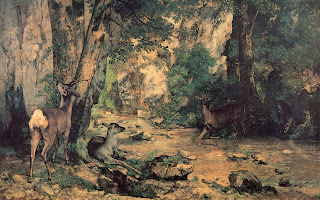 When we think of “healing waters” or medicinal springs, our first thoughts are typically of Lourdes, France or perhaps Hot Springs, Georgia, made famous by President Franklin D. Roosevelt. There is, however, another spot where springs of “miracle water” flow and it’s found in my own state of Indiana. Long before the arrival of the French settlers, the native people and wooded animals were already availing themselves of the area’s mineral salt “lick” deposits. 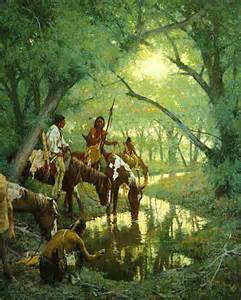 The native people considered the springs a gift from the Great Spirit. 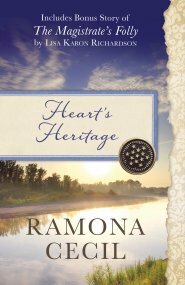 the early 1840s he built a hotel and health resort touting the area’s healing waters. 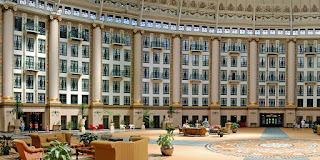 In 1845 Dr. Bowles leased land in West Baden, a mile from his resort in French Lick, to Dr. John A. Lane, who opened his own hotel and health resort; West Baden Springs. Both health resorts remained in business throughout the 1800s under the ownership of different physicians. 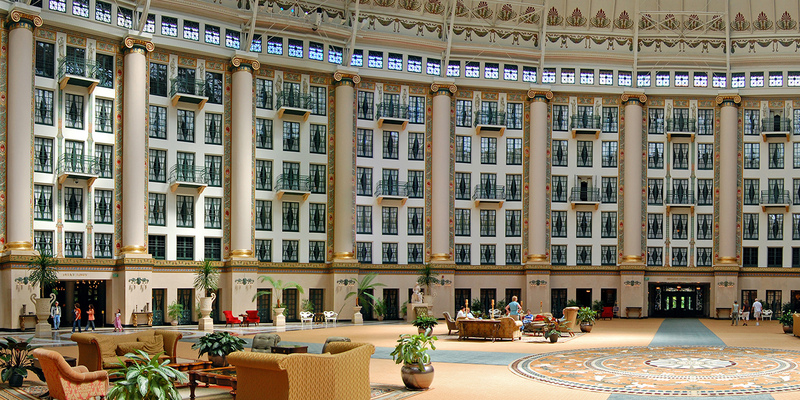 1901 ushered in not only a new century, but the heyday of the French Lick and West Baden hotel/health resorts. 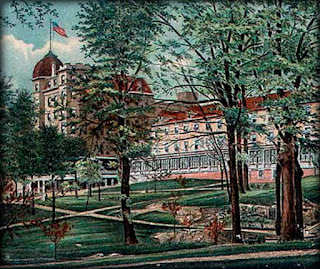 Tom Taggert, a business man and politician from Indianapolis bought the property and, with a group of investors, formed the French Lick Hotel Company. Besides renovating and modernizing Dr. Bowles original hotel and spa, Taggert convinced the Monon Railroad to lay a spur to the resort and run daily trains from Chicago the hotel. He also brought electricity, fresh water system, and a trolley to the town and built a new bottling facility to bottle the mineral water from what he called his “Pluto Spring” named for the mythical god of the underground. There is a scary-looking devil-like statue of “Pluto” in the French Lick museum. 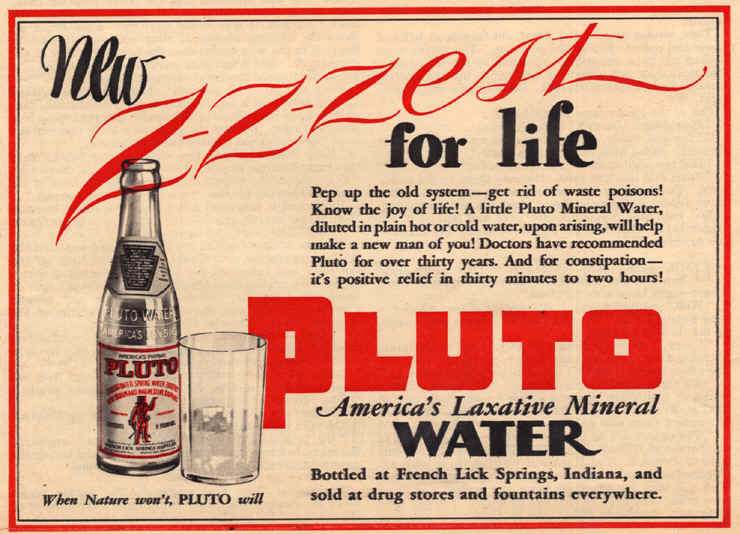 Pluto Water became famous for its healthful properties, particularly as a natural laxative. 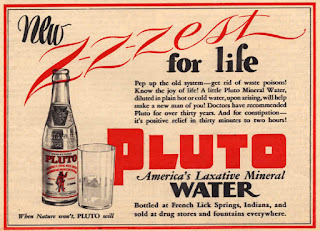 It’s advertising slogan claimed “When Nature Won’t, PLUTO Will.” French Lick’s “miracle water” became wildly popular all over America. In 1907, even the famous illusionist and escape artist Harry Houdini posed in front of an advertisement for PLUTO Water in Indianapolis, Indiana. 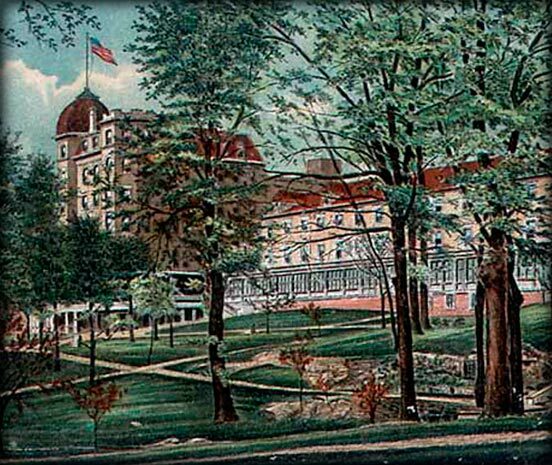 1902, the new West Baden Springs Hotel—a circular building with an immense dome—was billed as “The Eighth Wonder of the World.” The West Baden Hotel offered its own brand of mineral water called Sprudel Water. 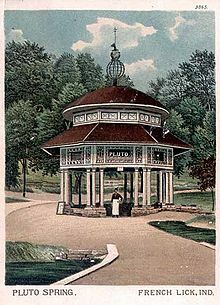 Besides drinking the water that claimed to cure or improve a wide array of afflictions, guests could bath in elegant spring pavilions arranged around a sunken garden. By the Roaring Twenties, celebrities of all stripes began to flock to French Lick/West Baden, Indiana to enjoy Taggert’s and Sinclair’s magnificent resorts and spas. I’m guessing that mineral water wasn’t the only liquid refreshment sampled by visiting A List patrons during those prohibition years. Illicit gambling was also rumored to have taken place at both resorts. I’m shocked!! The stock market crash in 1929 dealt a fatal blow to the West Baden Hotel and it closed in 1932. 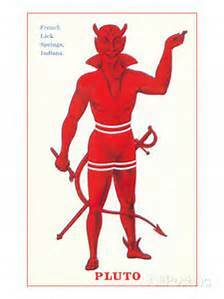 For the next fifty years the property was a Jesuit seminary, then a private college. Taggert’s French Lick Hotel Resort and Spa weathered the stock market crash possibly due to the addition of two world-class golf courses. 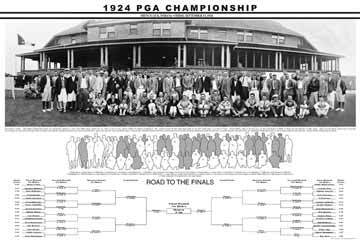 The Hill Course hosted the 1924 PGA Championship. Well past the first half of the last century, the French Lick Hotel boasted a guest list that reads like a Who’s Who of the rich and famous; Joe and Rose Kennedy, Franklin D. Roosevelt, Harry Truman, Richard Nixon, the Reagans, John Barrymore, Abbot & Costello, Bing Crosby, Bob Hope, Howard Hughes, Lana Turner, Hoagy Carmichael, Duke Ellington, Louis Armstrong, and many more enjoyed the amenities including a dose of PLUTO Water at the hotel’s luxurious PLUTO Bar. In 1971 the production of PLUTO Water halted when the FDA classified Lithium, a naturally occurring element in the water, a controlled substance. The French Lick Hotel and Resort languished in disrepair for decades until a group of preservationists bought both the French Lick and West Baden properties in the mid 1990s with an eye toward restoring the resorts to their earlier grandeur. Once again patrons can avail themselves of the mineral waters as well as the world class golf courses and even gambling. I’m shocked!! While bottled PLUTO Water is no more, visitors to French Lick can still view the mineral spring that started it all, now housed within the French Lick Museum and guests at the hotels can bath in the mineral water. They called it “Miracle Water.” Was it a cure-all for myriad ailments? Probably not. But that a back-woods mineral spring could precipitate the building of world-class hotels and spas, attracting a clientele of the most rich and famous to the southern Indiana sticks. . .well, maybe it was miracle water after all.